For more than a hundred years, Brontosaurus — the long-necked and long-neglected icon of the Ancient West — has been dismissed as a mere duplicate in the record books of natural history. But new research released today concludes that the lumbering beast was, in fact, its own type of dinosaur after all. Not only that: Another dinosaur, known for nearly a century as a species of Diplodocus, actually belongs to an entirely separate genus, given the new name Galeamopus. 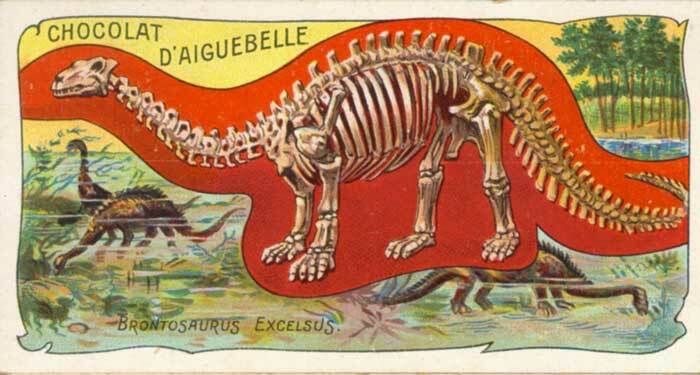 And a sauropod called Dinheirosaurus turns out to be the same as a plant-eater known as Supersaurus. These and other surprising findings are the result of a new reinvestigation of the entire family of enormous, whip-tailed, tiny-brained dinosaurs known as diplodocids. A team of paleontologists from Portugal and the U.K. undertook the research, but not because they wanted to defend Brontosaurus’ good name. Instead, they initially just wanted to identify the different fossils that had been amassed by a Swiss museum. “Our goal was to identify diplodocid specimens in the collections of the Sauriermuseum Aathal in Switzerland down to the species level,” explained Emanuel Tschopp, who led the research as part of his doctorate work at Portugal’s Universidade Nova de Lisboa. “Because of that, we figured at some point that we would have to revise the entire species taxonomy of the diplodocids. If Brontosaurus‘ new designation takes hold, it would bring the turbulent tale of the giant dinosaur right back to where it started, nearly 140 years ago. The confusion began in the late 1870s, when paleontologists discovered two specimens of diplodocid that had never been seen before. The museum at Yale University displayed a cobbled-together version of the Brontosaurus specimen — including a skull borrowed from a completely different kind of dinosaur — and the beast became a sensation. Soon its name became synonymous with the ancient life of the primordial West. But in 1903, a re-analysis of the two Western specimens concluded that they were different species of the same genus — Apatosaurus — which, having been discovered first, became the new official name for both. More than a century later, both of these fossils came under new scrutiny by Tschopp and his colleagues. In order to organize all of the known diplodocids, the team first pinpointed the animals’ most important distinguishing physical characteristics — 477 key traits in all — and compared them among 81 different specimens. Forty-nine of the specimens were diplodocids — including the original Brontosaurus and Apatosaurus fossils — but the rest were other “leaves on the family tree,” Tschopp said. They included dinosaurs like Dicraeosaurids, the group most closely related to diplodocids, and Macronarians, such as Camarasaurus and Brachiosaurus. “By including all these species, we were able to put the diplodocids in a good and well-supported wider context,” Tschopp said. The team then compared the key traits, or characters, of each specimen point by point. “The [physical] characters describe subtle details in the shape of bones throughout the entire skeleton, like different orientations or length ratios of vertebrae or leg bones, the occurrence of small features like processes or hooks on particular bones, the number of teeth in the mandible, and so on,” Tschopp said. The results of the comparison were then fed into two different mathematical models that measured the degree of similarity and difference among all of the specimens. “Both [methods were] based on the idea that the less similar two individuals or groups of individuals are, the more distantly related they are,” Tschopp explained. Using two mathematical models allowed the researchers “to establish the distinction between species and genera in a consistent way in all diplodocids,” Tschopp said. The comparison yielded at least 11 differences between Brontosaurus and Apatosaurus, the team reported — including variations in some of the vertebrae, as well as bones in the feet and shoulder. “The differences we found between Brontosaurus and Apatosaurus were at least as numerous as the ones between other closely related genera, and much more than what you normally find between species,” Dr. Robert Benson, an Oxford paleontologist who was part of team, said in a press statement. “If we wanted to be consistent within the entire group of diplodocids, the only reasonable interpretation was that Brontosaurus was a valid genus,” Tschopp added in the interview. This is what happened to Dinheirosaurus, a genus of dinosaur known from a single specimen found in Portugal, and Supersaurus, a similar sauropod found in Colorado and Wyoming. “The differences we saw between these two genera were just not higher than what’s present between the two generally accepted species of Diplodocus, for example,” he said. While the team acknowledges that not all of their conclusions will be readily accepted, Tschopp said their new diplodocid family tree may help other scientists study the chronological and evolutionary relationships among these dinosaurs. “Once we have a good knowledge of how much time passed between the first and last occurrence of a diplodocid in this area, we’ll be able to see which species occurred first, which species lived together, and how they competed with each other and so on. And when it comes to their most significant revision to the natural-history books, Tschopp said their research is only the beginning of what will surely be a long and public conversation about the fate of Brontosaurus. “It took years for the inclusion of Brontosaurus into Apatosaurus to be accepted, so it will also take a while for the opposite,” he said. “However, we’re convinced to have good evidence to get this discussion started, and are looking forward to comments and inputs from fellow researchers. Tschopp and his colleagues report their findings in a 298-page paper in the online journal PeerJ.